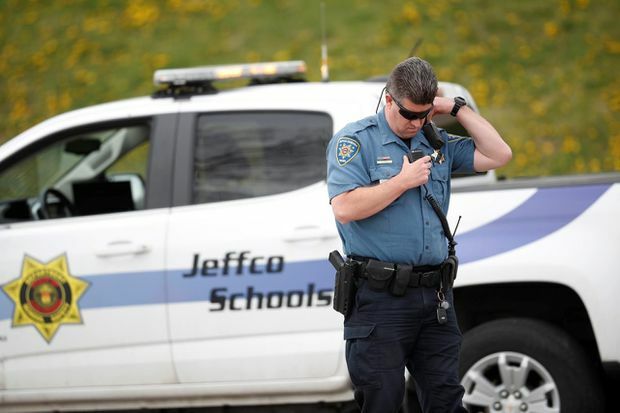 An officer from Jefferson County, Colo., Schools listens on his radio as students leave Columbine High School late Tuesday, April 16, 2019, in Littleton, Colo.
A Florida teenager believed to be obsessed with the Columbine massacre was found dead in Colorado on Wednesday after she triggered a manhunt by making a “pilgrimage” to the state, days before the 20th anniversary of the infamous school attack. Sol Pais, an 18-year-old student from Surfside, Florida, was found by authorities in Clear Creek County, about 40 miles (64 km) west of Columbine High School, where two teenaged male students shot and killed 12 classmates and a teacher on April 20, 1999, before committing suicide. Pais appeared to have been killed by a self-inflicted gunshot wound, Jefferson County Sheriff Jeff Shrader said during a news conference with school officials. Columbine is in Littleton, a Denver suburb that includes part of Jefferson County. Denver area schools will resume classes on Thursday after closing on Wednesday while FBI agents, Jefferson County deputies and Colorado state troopers searched for Pais. “To close an entire metro area is not an easy decision, but at the end of the day, it’s the right decision and best decision to protect all of our kids,” said John McDonald, executive director of Jefferson County Department of School Safety. Since the massacre at Columbine, there has been a decades-long string of U.S. school shootings, some inspired by copycats who have expressed fascination with the massacre. Columbine was the second deadliest shooting at a school in U.S. history at the time. Now it stands fifth, surpassed by the high school shooting in Parkland, Florida in 2018, the shooting at an elementary school in Newtown, Connecticut in 2012 and a 2007 shooting at Virginia Tech. With the rash of school shootings across the nation, security alerts and safety drills have become commonplace. In Denver public schools alone, there have been 22 lockdowns and 294 lockouts over the past two academic years, according to school data cited by the Denver Post. Frank DeAngelis, who was the principal of Columbine High School 20 years ago, said during the news conference that he reached out to 15 school staff who were working on Tuesday and had been at the school when the gunfire erupted in 1999. “It takes us back. The month of April comes and it just does it to us all,” he said. Students and staff will have mental health counsellors at the school on Thursday to help with “grief and processing mental issues,” a school official said. “There was a pilgrimage here. That’s pretty clear and convincing evidence that we have a threat to the school,” McDonald said. On Tuesday, an FBI bulletin said authorities lacked probable cause for a formal arrest but that law enforcement should detain Pais for a mental-health evaluation.